Every weekend thousands of dogs and their owners are travelling the roads of the UK to exhibit at dog shows. Some owners even travel abroad to compete with their foreign canine enthusiasts. From dogs as small as Chihuahua’s to Irish Wolfhounds are packed into their owner’s cars for the long journeys that are often achieved in one day, returning late the same night. An early start is not uncommon for exhibitors who have to be on the show grounds at the start of judging which is normally 10 am. Anyone arriving later than eleven in the morning could be stopped from entering the show area as many dog shows have a strict arrival rule. When travelling at such an early time and covering a long distance it is advisable to stop every hour to let the dog stretch its legs and do its business. The car driver should also take a break as well. It is not very often that shows are cancelled so regular travellers will be prepared for every type of weather. Even in the summer months it is not uncommon to have to wear wellington boots to get across a muddy show ground. However muddy the owners get the dogs are kept as clean as possible ready for exhibition. For the heavily coated breeds it is possible to purchase coats and boots for the dogs so that they arrive at the show in pristine condition. For exhibitors wet weather clothing must always be packed along with a towel in case of a deluge. Sun block is another essential as there can be many hours of exposure to the sun during the summer months. Food for the day is another must along with water or cold drinks. Flasks of hot drinks are advisable for the winter months. Food can be expensive at the larger show grounds and taking your own food is always a good idea.A mobile telephone is another essential item when an exhibitor is covering so many miles each week in case of an accident or breakdown. A map book and a shovel (in case of snow) are also essential kit items for the car. Many cars now have air conditioning, which is a godsend in the summer months, keeping both the owner, and dogs cool on the journey. However if your car does not have this facility invest in fans that either run off of the car battery or by a small solar panel. There are times when you will be stuck for hours on end on motorways due to hold ups and need to be able to cool down the car. Bottles of water that have been put into the freezer overnight before a journey are also handy to have for cold drinks during hold ups or to cool down a hot dog. The bottles would have defrosted during the day and just be nicely cool for the journey home. Never give a hot dog freezing cold water to drink, just drench a towel in cool water and lay over the dog’s back to bring his temperature down slowly. Many exhibitors stay overnight for the larger dog shows. There are so many during the summer months that many people either camp or take a caravan and simply move from one show to another for their summer holidays. If you are only showing one or two dogs staying at a bed and breakfast place that accepts dogs means you can see something of the countryside near the show ground. 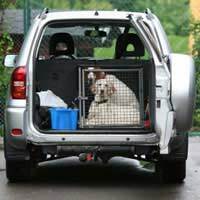 Some people fit out a van with cages to enable them to take several dogs to a show. In a van there is also room for the owner to take a nap during breaks in the journey.There are also trailers designed to take dogs and cages and be towed behind the exhibitors cars. In fact if you can afford it most types of vehicles can be adapted for the modern exhibitor. Travelling to, and attending dog shows is an enjoyable way to spend your leisure time. With a little planning and foresight the trips will go without any hitches.